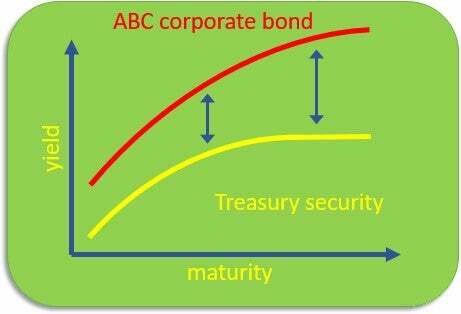 The term structure of interest rates – known as the yield curve – is the relationship between interest rates or bond yields that differ in their length of time to maturity. The term structure reflects investor expectations about future changes in interest rates and their assessment of monetary policy conditions. The term structure of interest rates is constructed by graphing the YTM and respective maturity dates of benchmark fixed-income securities. Because U.S. Treasuries are considered risk-free, their yields are often used as the benchmark. The term structure of interest rates is graphed as though each coupon payment of a noncallable fixed-income security were a zero-coupon bond that matured on the coupon payment date. If the normal yield curve changes shapes, it can be a signal to investors that it’s time to update their economic outlook. A normal yield curve forms during normal market conditions, when investors believe there won’t be any significant changes to the economy (e.g., interest rates) and the economy will continue to grow at a normal rate. During these conditions, investors expect higher yields for bonds with long-term maturities than those with short-term maturities. This is a normal expectation since short-term instruments generally carry less risk. The further out a bond’s maturity, the more time and uncertainty investors face before being paid back the principal. As current interest rates increase, a bond’s price will decrease and its yield will increase. A flat yield curve indicates that the market is sending mixed signals to investors, who are interpreting interest rate movements in various ways. In these situations, it’s hard for the market to determine whether interest rates will move significantly in either direction. 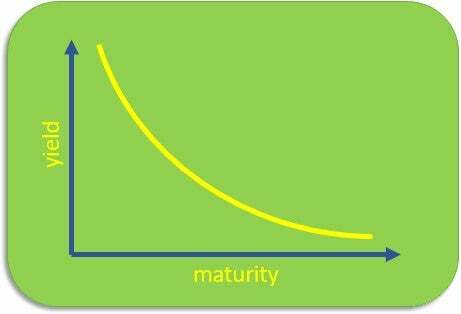 A flat yield curve generally happens when the market is making a transition between normal and inverted curves. When the yield curve is flat, you can maximize your risk/return tradeoff by choosing fixed-income securities with the least risk, or highest credit quality. Inverted yield curves are uncommon; they form when long-term debt instruments have a lower yield than short-term debt instruments of the same credit quality. 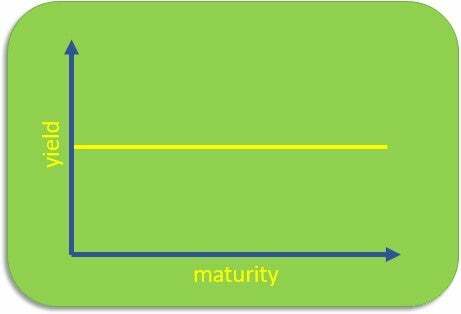 Bonds with maturity dates further into the future are expected to offer lower yields than bonds with shorter maturities. Some investors interpret an inverted curve as an indication that the economy will experience a slowdown, leading to even lower yields. The idea is that before a slowdown, it’s better to lock money into long-term investments at present prevailing yields because future yields will be even lower. 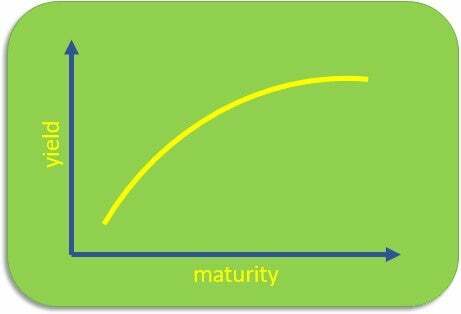 Another type of yield curve is the theoretical spot rate curve, which is constructed using Treasury spots instead of yields. This curve accounts for the fact that many Treasuries offer varying coupons and would, as a result, not accurately represent similar noncallable fixed-income securities. If you compare a 10-year bond paying a 7% coupon with a 10-year Treasury bond paying a coupon of 4%, your evaluation wouldn’t mean much: While both bonds have the same 10-year maturity, the 4% Treasury coupon would not be an appropriate benchmark for the bond paying 7%. 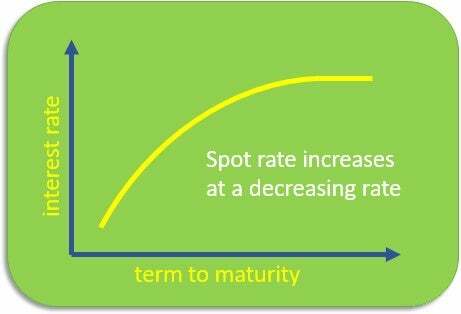 The spot rate curve offers a more accurate measure since it adjusts the curve to reflect variations in the interest rate of the plotted benchmark. The interest rate taken from the plot is known as the spot rate. The credit spread (or quality spread) is the difference in yield between a U.S. Treasury bond and a debt security with the same maturity, but lesser quality. Credit spreads between U.S. Treasuries and other bonds are measured in basis points, with a 1% difference in yield equal to a spread of 100 basis points. For example, assume a 10-year Treasury note has a yield of 2.54%. If a 10-year corporate bond has a yield of 4.6%, then the corporate bond offers a spread of 206 basis points over the Treasury note. Credit spreads vary based on the credit rating of the bond issuer. Debt issued by the U.S. Treasury is used as the benchmark (because it’s risk-free). As the default risk of the issuer increases, its spread widens. In general, when interest rates are declining, the credit spread narrows. The spread is demonstrated as the yield curve of the corporate bond and is plotted with the term structure of interest rates. Treasury yield curves are a leading indicator for the future state of the economy and interest rates. Learn about the types of bonds you should consider investing in, when you should be buying them and how to compare yields against their time to maturity.